MCC’s duo to play softball at Northern State Univ. 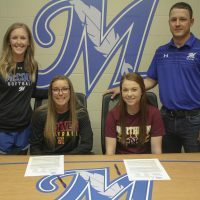 Two McCook Community College softball players have signed on to continue their careers together at NCAA Division II Northern State University in Aberdeen, S.D. Sophomores Emily Charchuk and Chanel Siebenthal and made it official at a signing ceremony recently at the Peter and Dolores Graff Events Center. The two made a visit to South Dakota back in January and both said they visited with the coach, players, toured campus, the community and spent a full day of working out with the team. Charchuk, a middle-infielder from Victoria, British Columbia, was sidelined with health issues for a few games early in the season, but has responded, hitting .359 with 29 runs scored, 21 RBIs, 11 doubles, two home runs and five steals. She’s really heated up in April batting .478 this month and slugging .870. Last season, she batted .439 with 25 doubles (setting the MCC single-season record and the fifth most doubles in the nation), four triples, five homeruns and scored 66 runs, which was also an MCC record. She is a marketing major. Siebenthal (Lakewood, Colo.) has played in all 36 games for MCC and is batting .426 with 41 runs scored, 24 RBIs, 13 doubles, a home run and 18 steals (fifth most in Region IX). Last season the outfielder batted .405 with 16 doubles, six triples, five homeruns, 57 runs scored, 43 RBI’s, and 17 stolen bases. “I am super excited for these ladies it is a great program and earning a chance to move on is well-deserved,” said MCC Coach Josh Barnes. At the recent signing ceremony the two teammates spoke about how MCC has felt like a family a soon as they arrived on campus — from the coaches, athletic staff, teachers and particularly with the connections they have made in the community.